(Phys.org)—Researchers have designed a nanoscale device that, under ideal conditions, can confine a "bit" of light (that is, light with a single precise energy value) for an infinite amount of time. Although a physically realized device would inevitably lose some of the trapped light due to material imperfections, the researchers expect that it should be possible to completely compensate for this loss by incorporating some form of optical gain like that used in lasers, so that in principle the lifetime can be infinitely large even in a real device. Sylvain Lannebère and Mário G. Silveirinha at the University of Coimbra in Portugal have published a paper on the new light-trapping device in a recent issue of Nature Communications. As the researchers explain in their paper, previous research has confined light for finite periods of time using mirrors and specially engineered materials, but confining light indefinitely—even in theory—remains elusive. "Light is an object difficult to tame," the researchers wrote in their paper. "No matter how elaborate and intricate are the material constructions that may be used to screen it from the exterior environment, there is always some residual coupling with the radiation continuum, and hence light—if not absorbed by the material walls—always finds its way out." But now the scientists may have found a way to keep light in. "We have unveiled a way to trap light in an open nanostructure with a lifetime which, in ideal circumstances, can be infinitely large," Silveirinha told Phys.org. To overcome light's penchant for escaping, Lannebère and Silveirinha utilized an idea proposed by John von Neumann and Eugene Wigner in 1929, and later extended by others, which has led to the discovery that transparent structures with tailored geometries can perfectly confine light by scattering it in a very specific way. Lannebère and Silveirinha showed that this strategy for confining light can be achieved by shining light on a spherical "meta-atom," so-named because it allows light to have only a specific quantized energy value (creating a light "bit"), similar to how an atom allows electrons to occupy only certain quantized energy levels. Time animation of the electric field when the meta-atom is illuminated by a light pulse. Credit: Lannebère, et al. "I always like to make a parallelism between our system and the classic Rutherford's atom wherein the electrons orbit around the nucleus," Silveirinha said. "Because the electrons continuously emit light as they move in curved orbits, in this model they eventually collapse into the nucleus, and this is the origin of the instability of the Rutherford atom (and which led to the development of quantum mechanics). When light is put inside a cavity, it basically interacts with the matter that surrounds it (e.g., glass or metal), and this gives rise to microscopic charge oscillations, so that, similar to the Rutherford atom, the energy of the system is eventually radiated away. What is extraordinary is that under very peculiar circumstances—using materials with a vanishing permittivity—there is an opportunity to suppress the radiation loss, and hence avoid the time decay of a natural oscillation of the system." In order for the scattered light to stay confined, the wavelength of light in the meta-atom's core must have a very specific value. As the scientists explain, the trick to letting the incoming light enter the meta-atom but not escape afterwards relies on a nonlinear effect that enables squeezing the light wavelength in the core until it reaches a critical value at which the light is perfectly confined by the meta-atom walls. This critical light wavelength in the core is determined by the amount of stored energy, so that the light trapping occurs only for a very precise (quantized) energy value. Based on this strategy, the optical meta-atom can trap a bit of light for a time limited only by imperfections in the materials. To compensate for this inevitable loss, the researchers suggest using an optical gain element, like a weaker version of the gain used in lasers. 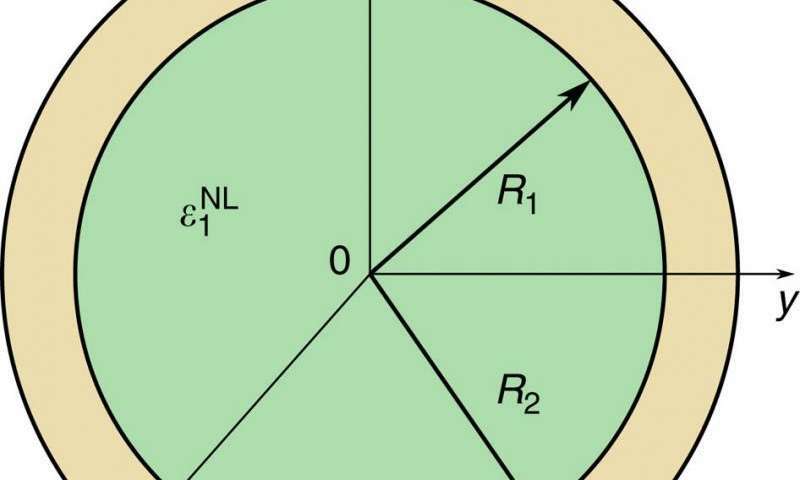 This addition would also enable the meta-atom to serve as a basic one-bit optical memory. While storing light for long times is highly desirable, there are also times when the light needs to be released. In order to quickly free the trapped light, the researchers have proposed illuminating the meta-atom with a second light pulse, which would collide and mix with the trapped light in a way that would cause a quick release. In general, the ability to confine light in a small region of space has a variety of applications, including light-emitting sources, chemical and biological sensors, and other nanoscale photonics devices. Time animation of the electric field during the collision of a second light pulse with the meta-atom to free the confined light bit. Credit: Lannebère, et al. "The most important application could be the design of an all-optical memory," Silveirinha said. "In the last decades, the traditional silicon technologies have been pushed to the limit in terms of processing speed. We believe that our study may open new inroads and contribute to the on-going effort of finding competitive alternatives to the standard silicon technologies using photonic integrated platforms and their unbeatable switching times and transmission capacity." Currently, the scientists are exploring planar-type designs for the meta-atom that can be more easily integrated on a chip. They also hope that their theoretical work may trigger the attention of other groups who have the means to realize the meta-atom experimentally. And what would a trapped light bit look like? "In theory, the stored light cannot be seen from the outside," Silveirinha said. "However, any realistic solution requires a gain mechanism to keep the light confined in the meta-atom. If the gain element is switched off, then the light within the meta-atom will be released, and then it may be seen with the naked eye!" Well, infinite phonon life is pure nonsense! Cars, businesses, technology; on average obsolete, wrecked, discarded, etc within 10 years. That is 10 x 365 x 24 x 3600 seconds = 3E7 seconds, obviously longer than the trap device has been tested for. This amount of time is vastly less than infinite; 1E100000000000000000000000000000000000000000.....+++seconds. Nonsense assumptions result in nonsense conclusions. Get real! ...so that in principle the lifetime can be infinitely large even in a real device. And so, apparently, can the project's funding! Of course, we can't actually show it to you, or it would escape, but trust us, it's still in there! So many questions... So if you can't see the trapped light it's equivalent to an infinite black hole. But will it evade the big crunch? Does the word theoretically mean imaginary? Is this the realization of von Neumann's anti entropy demons? And what does this have to do with a floating Boltzman brain? Or is it an artifact of a hologram brane? And where in the world is Lisa Zyga? I had an 8 diode transistor radio, with news, sports, and crazy liberals. Our conventional electron assembly is coming to an end, and photonics will eventually overtake our commercial needs.